Four fabulous spreads for the sweetest tasting corn you'll ever eat! Remove the husks and silk. Place the cobs in a kettle of boiling water. (Use a large enough kettle so corn isn't crowded.) Cover and return water to a boil. Boil for 3 to 4 minutes. Do not overcook. Peel back corn husks, but do not remove corn from the base of the cob. Remove silk. Fold husks back into place and soak corn in water bath for 10 to 15 minutes. Heat grill to high and place corn in husks, on grill. Grill for 20 minutes, turning every 5 minutes. Husks will blacken. When corn is done, remove from grill and carefully peel back and remove husks. 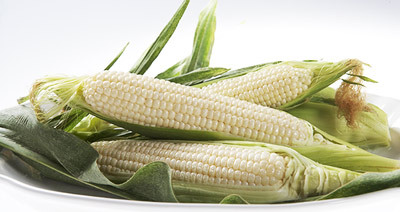 For more of a grilled flavor, peel back husks and return corn to grill for a few minutes on each side. Mix butter with chopped herbs. Brush over cooked corn. Stir together lime juice and chili powder. Brush over cooked corn. Mix butter, mustard and horseradish until blended. Brush over cooked corn. Stir together mayonnaise and hot sauce until blended. Brush over cooked corn.